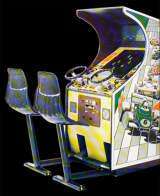 Arcade Video Game published 44 years ago by Midway Mfg. Wheels II © 1975 Midway. Single or double player game containing no microprocessor. 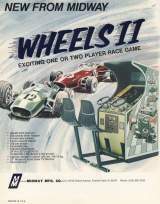 Players race their cars against computer cars, gaining points for elapsed distance before time runs out. Crashing requires the player to shift into low gear to start again (2 speeds).